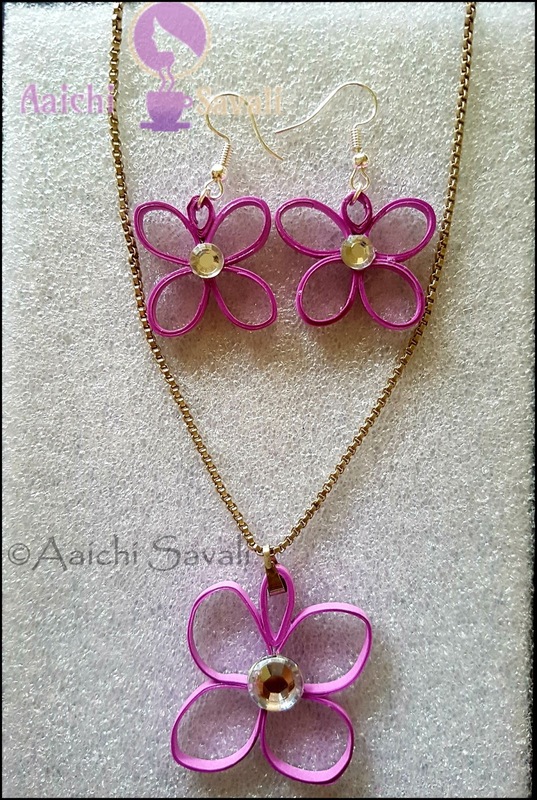 This tutorial will show you how to make a purple quilling paper flower earrings and necklace or pendant. The basic materials used are paper of various thicknesses, glue, and a special instrument that is used to roll paper strips and rhinestones. Hope you like this purple quilling paper flower necklace and earrings set. 3 rhinestones for decorating earrings and pendant. Divide strip into two and make small circles by using purple strip. Make 4 teardrop shape petal for each earring. Over the center glue rhinestones (I have used white one) and repeat the procedure and make another earring and pendant. (To make pendant I have used 2 times bigger circle than earrings). Make 3 small circles out of an purple color strip and press edge to get the teardrop shape(to roll this circles I have used slotted quilling tool). Attach them to the center of rings and pendant to attach hook and chain(we can say it as a hook holder). Take jump rings and attach it to hook holder, then attach the hook, close the jump ring and do same with the chain. Voila! Beautiful and easy earrings and necklace are ready. Well now you know how to make a beautiful Quilling Necklace and earring. If you liked this project let us know. I just love this Quilling art.Good to know that you used to do it.